Happy Vishu to all of you! . Vishu is celebrated as new year day in Kerala and some parts of Tamil Nadu. 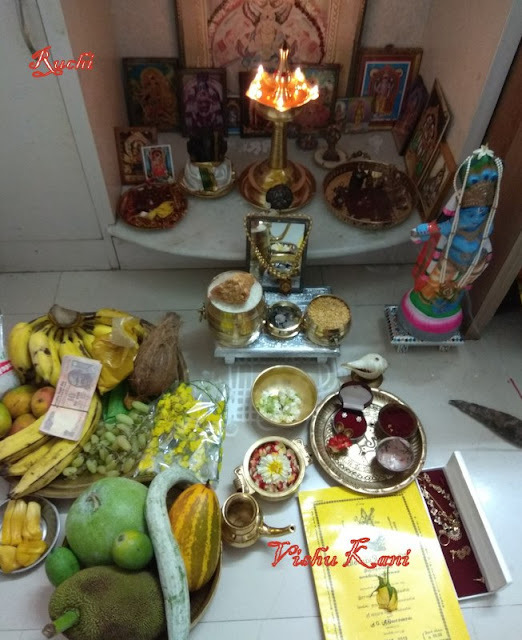 Vishukani is a traditional ritual of arranging several auspicious things to be seen on the Vishu day in the early morning. For celebrating Vishu sweet dish will be prepared . so I made pradhaman; which is delicious It is mainly prepared for special occasions and festivals days. So, I decided to make Mukkani pradhaman for Vishu today.There are several 'varieties Payasam' or 'Pradhaman' each with its own unique taste and flavour. The difference between the two is that Payasam uses milk and sugar, Pradhaman is made with coconut milk and jaggery and it is also mostly made with lentil or with ripe fruits. Mango, Jackfruit and Banana are the most very important fruits. They are called 'Mukkani'/ Tri-Fruit As these fruits are seasonal and available all together at this summer, thought of preparing a dessert with these fruits which resulted in my MUKKANI pradhaman. Correct amount of mixtures gives the unique blend and enhance the taste of Pradhaman/ payasam. . Mukkani Pradhaman is scrumptious and flavourful. So try this dessert in this summer bcz these fruits available in summer only! After posting this recipe in BBgroup in Fb One member of this group shared this poem . It's quite interseting. அடி மலர்க்கென் சொல்லணியாம் அலங்கலணிந்தருளே "
Take a 1 1/2 fresh coconut, grate it finely. In a blender or food processor, add the grated coconut with1 cup of water and process for a minute, then squeeze it for milk. This gives you 1cup thick milk. Return coconut to processor and add 2 cup water and process for couple of minutes and squeeze it for milk in separate bowl. This gives you 1cup thin milk. Like that extract light, thin thick coconut milk. 2.Peel and roughly chop half the quantity of mango and banana, de-seed the jack fruit and grind these all together to a fine paste without adding water. 4. Meanwhile melt the jaggery and strain it, Fry the cashews and Raisins in the ghee and keep it aside. 5. Once the sabhudhana cooked add the jaggery syrup and let it cook for 2-3 minutes. 7. Now add third extract coconut milk and let it cook for one boil only. 9.Finally add the first milk and cook for couple of minutes and switch off the flame. Never boil after adding thick coconut milk. 10.In leftover ghee roast the finely chopped fruits (banana, jack fruit and mangoes) until they turn golden brown. 11. Nowadd the fried cashews,cardamom powder and fried fruits to pradhaman and give it a mix. 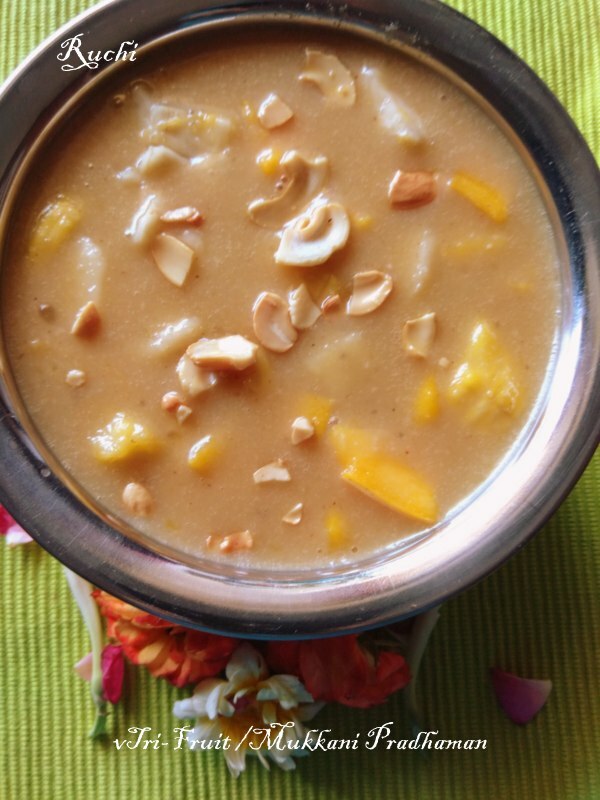 12.Delicious Pradhaman /Payasam is ready to serve. Serve hot or chilled as you wish and Enjoy!